SUNRISE, FL – After a a lighthearted day of physicals and team photos, the Florida Panthers were finally able to lace up their skates and hit the ice for their first official day of training camp on Monday morning. Notes: With injuries to both Marcel Goc and Sean Bergenheim, the once questionable idea of bringing veteran Alexei Kovalev to camp could pay off for the Panthers as an impressing show during camp could end up earning him a spot on the roster. Marcel Goc: Marcel Goc will reportedly miss at least the first three games for this season while nursing an ankle injury suffered during the lockout. Erik Gudbranson: Like Goc, Erik Gudbranson is also expected to miss at least the first three games for the Panthers this year after suffering a shoulder injury while wake boarding during the off season. Sean Bergenheim: The extent of Sean Bergenheim’s injury is still in question and should become more clear within the coming days. However, with the season fast approaching I would expect him to miss some time early on. 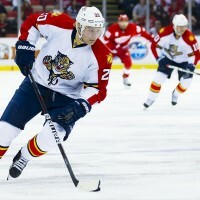 Dmitry Kulikov: A long lockout kept the Panthers from opening up contract talks with RFA defenseman Dmitry Kulikov and now it’s coming back to bite them. It is still unclear whether or not Kulikov is still currently in Russia, but GM Dale Tallon has made it clear that getting Kulikov signed and into camp is a top priority. -The Panthers will be holding a team scrimmage this Wednesday (January 16th) at their practice rink in Coral Springs. The event will be open to the public and should give fans their first glimpse at the club in action this season. -Tickets are still available for the Panthers’ season opener against the Carolina Hurricanes on Saturday January 19th starting as low as $7 a ticket! Come out and see the club raise their first ever Southeast Division Championship banner into the rafters as the club kicks off their 2013 season with a bang. Tickets can be purchased here.